Paragliding is slowly but surely becoming popular in Viet Nam. Women like Tran Thi Thu Thuy are doing it in Da Nang. She started practising on the beach and on the sand dunes. Duong Hien Hoang has been at it a bit longer and now teaches people who are new to the sport how they can fly like birds. Having reached Mount Fansipan in 2000, Tran Thi Thu Thuy continues her adventures with paragliding, a new aerial sport on the Son Tra Mountain in the central city Da Nang. Thuy, 31, one of the four women members of the Da Nang Paragliding Club, has practised the airborne skill since she participated in the team's training sessions last year. "It is an easy skill for beginners. I just started paragliding on the sand dunes of Lang Co and the beaches of Da Nang before I could take off safely," Thuy said. "Practising with a parachute offers me the hands-on experience to control a parachute and use equipment, such as GPS, radio, and wind meter," she said. She revealed her love for adventure and how the sport truly challenges her. "My friends have never shown a positive response whenever I have shared my past paragliding experiences with them. They perceive it as a dangerous sport for me. Of course, the male paragliders do seem to have an edge over me, but my desire is to fly and enjoy the bird's eye view of the city and beach similar to what we can see through an airplane window," she said. Duong Hien Hoang, 46, a businessman, who is one of the five founders of the Da Nang club, elaborated that paragliding creates incredible moments. Hoang, who was trained by members of the Ha Noi Paragliding Club few years ago, often helps newcomers by sharing techniques and experiences of flying with them. "Newcomers can fly after three months of regular training. However, they can be trained in 15 minutes for taking off from a mountain and landing on a beach," Hoang said. "A senior paraglider can even fly for hours. The paraglider takes advantage of the rising thermals from the earth to fly higher and longer. But, it needs regular training and flying during hot days," he explained. "I can find different thermals when I fly from the Son Tra Mountain down to My Khe and Man Thai beaches along the coastline road. Each thermal took me as high as the top of the Son Tra Mountain. I moved between thermals and each one kept me airborne for a longer time," the 46-year-old said. "Flying is a very special feeling when your feet are off the ground and your body is drifting in the air. Only the wind blows and your hands steer the parachute up and down, right or left. It is your game with the wind," he vividly said. Hoang added that the equipment for a flyer is not that expensive as a paraglider can opt for second-hand equipment at around VND70 million (US$3,260). The Ban Co Mountain, 573m above sea level, is a favourite among the club's members on weekends as its large and flat area is ideal for take-off. "It depends on the wind speed. We can fly with wind speeds ranging between 1.5 and 5 metres per second to take off perfectly," said Le Hai Son, a senior flier of the club. "All the members must follow strict safety regulations. We have to make meticulous preparations in order to ensure safety of every member. We do not allow any member to take off if the wind speed drops below the safety level," Son said. Hoang recalled that he got into trouble when he broke the rule once while taking off from the Son Tra Mountain. "It was a day when the wind speed was low, but as I was eager to fly, I took the risk and made an attempt. I fell down on the mountain side as soon as my feet lifted off the ground," Hoang said. "I eventually did not fall deep down in the valley, but a tree bruised my cheek and left a scar on my face. It is the only risk that I have ever taken so far," he said. Son admitted that all the club members were fearful of heights at the first time, but they almost cried out with excitement as their feet lifted off the air. "Experienced paragliders can take cameras to capture photographs that only airplane passengers can do. You can feel free to take photographs or record video clips while you are in the air," Son said, adding that he had a huge collection of aerial photographs. Huynh Ngoc Thang, 39, a sculptor, stated that he fell in love with paragliding after watching it in a television programme. "I found information about paragliding 19 years ago, including the techniques, equipment, and skills on how to control a parachute while you are in the air. But, I joined the club four years ago and I do enjoy flying with the club regularly," Thang said. "It does not take long to prepare for a weekend flying trip. An equipment pack weighing 18kg is all that is needed as I go to the mountain top by motorbike or walking. It only needs eight minutes for flying preparation and 15 minutes to fold the parachute," he said. Ho Nguyen Thien Phong, 24, the youngest member of the club, said that he had trained with the Southern Air Club in HCM City when he was a student of the city's Technique and Industry College. "I just trained with the air club on ground only, but I learnt the basic skills of parachuting after a year. However, I just took flying when I joined the Da Nang team," Phong said. "It is interesting as I overcame my fear of heights. I fulfilled my childhood dream of flying as a bird," he exclaimed. The Quang Ngai-born noted that the sport helped to make his brave and calm while tackling problems. "I have always known the risks involved in paragliding. But, I received ample training to handle nearly all the challenges posed while paragliding. Paragliding is actually an interesting form of recreation during weekends, and I wish to continue indulging in the sport," Phong said. Vice director of Da Nang's culture, sport and tourism authority, Nguyen Phuc Linh, remarked that the city has approved the plan to popularise the sport in order to boost tourism. 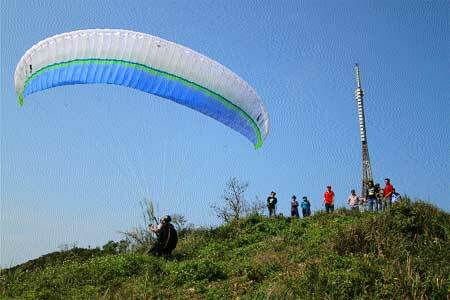 "Da Nang has successfully hosted international paramotor race and paragliding events. The city with a long and pristine My Khe beach is a favourite location for hosting aerial sports along with beach sports including jet-skiing, water-motor, and sailing," he said. "The club's and regular training of its members will provide professional guides for paragliding service to boost tourism. Paragliding is a recreational and competitive sport that took off in the country 10 years ago, but we are looking forward to boost it as new tourism attraction for summer vacationists," Linh said. An airborne skill is one that involves going up in the air. Hands-on experience means practical experience. A GPS is a geographic positioning system. It is a device that helps people find where they are and where they need to go. A wind meter is a device that measures the strength of the wind. "They perceive it as a dangerous sport for me." To perceive means to come to realise and understand something. Of course, the male paragliders do seem to have an edge over me, but my desire is to fly and enjoy the bird's eye view of the city and beach similar to what we can see through an airplane window," she said. By having the edge over someone, things are better for you than they are for that other person. A desire is a strong will. The founders of the Da Nang club are the people who started it. To elaborate on something means to offer to tell someone more about it. "The paraglider takes advantage of the rising thermals from the earth to fly higher and longer. But, it needs regular training and flying during hot days," he explained. A thermal is a column of warm air that rises. Birds, and paragliders, use them to float higher into the sky. "It is your game with the wind," he vividly said. To say something vividly means doing so in a lively way. "We have to make meticulous preparations in order to ensure safety of every member," Son said. Meticulous means showing great attention to detail. "But, I received ample training to handle nearly all the challenges posed while paragliding," Phong said. Ample training means sufficient, or enough training. To popularise a sport means to make many people want to do it. "Da Nang has successfully hosted international paramotor race and paragliding events." "The city with a long and pristine My Khe beach is a favourite location for hosting aerial sports along with beach sports including jet-skiing, water-motor, and sailing," he said. A pristine beach is one that completely unspoilt. "However, paramotoring is yet to gain momentum in Viet Nam and we expect to train pilots for the engine-driven flying," he added. To gain momentum means to take on a trend of becoming more and more popular in the way a wheel turns faster and faster as the vehicle it is attached to goes down a hill. 1. My Khe beach is an unspoilt place. 2. Ho Nguyen Thien Phong is 42 years old. 3. Le Hai Son is very new to paragliding. 4. Ban Co Mountain is 573m above sea level. 5. The Southern Air Club is in Da Nang. 1. True; 2. False; 3. False; 4. True; 5. False.